Sculpted critical support and breathable materials make this the most comfortable ride you ever sat your seat on. 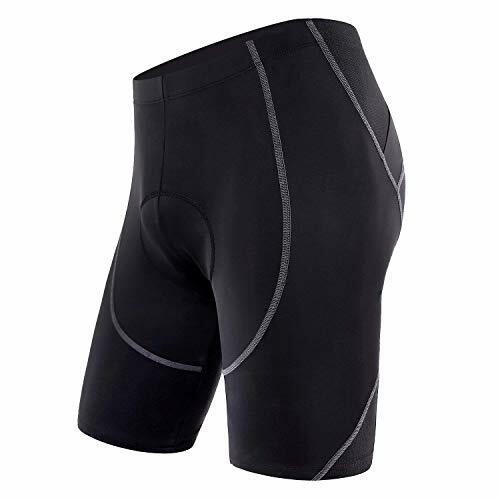 Offering the perfect balance between rider comfort and aero dynamism, these cycling shorts by Sportneer will have you switching up the gears on your road bike and saddling in for your smoothest ride to date. Engineered with a prize winning Nylon/Spandex blend that provides maximum moister transfer, Sportneer offers a second skin fit that doesn't shift in the saddle, and allows perspiration to pass easily through the fabric. The shorts' flatlock seams have been designed to offer maximum stretch and flexibility, giving you the freedom to peddle out ahead of the peloton with no pinch or bind. At last you can really enjoy the ride with Sportneer's high performance inner padding, which provides lasting comfort even after 20 miles at the handlebars. The pads' unique design which features three dense layers of shock absorbent sponge, offers critical support to the upper thigh and alleviates the strain caused by extended saddle pressure against the sit bone. While 80 breathing holes in the support keep seat of the shorts dry and eliminates the risk of chaffing and bacterial infection. SECOND SKIN FIT: Excellent stretch on seams gives a sculpted-to-the-skin feel that maximizes both comfort and aero efficiency. NO SWEAT BREATHABLE: 82% Nylon, 18% Spandex blend provides optimum moister transfer, keeping you dry and chaff free no matter how long the road ahead. CRITICAL SADDLE SUPPORT: Fitted with 3 layers of high performance sponge cushioning for maximum comfort. Breather holes keep the seat dry even during strenuous exercise. SILICONE GRIPPER: Integrated grip on the leg of the shorts offers a stay-put fit for greater freedom on the saddle. CAT EYE REFLECTOR: Highly visible reflector on logo makes for safer roadside riding after dark. The size for this products is Asian size. If you are from U.S.A or EU, please choose one or two size up. 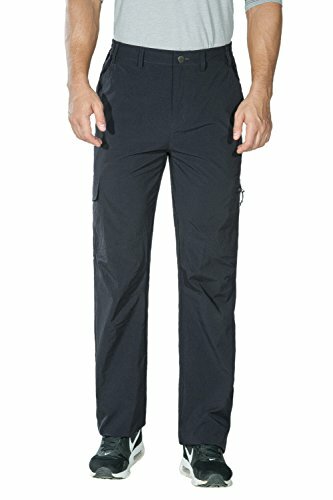 This professional athlete pants designed for most outdoor activities. The spandex and polyester knitting makes these pants one the most sturdy professional athletes pants. This well-built, industrial durable material, makes it an excellent choice for cycling, camping,hiking and other outdoor activities. The pants has an integrated lined fleece interior, useful for warmth retention. Trainers in cold find this particular feature very convenient. The micro-fleece lining in addition to promoting thermal insulation,It's also tailored to allow outdoor activities comfortably in weather or areas with temperatures as low as 14 degrees. The front area has an integrated high-quality polymer which is water repellent, thus, it can also be used even under wet weather conditions.The backside area is functional enough to keep a significant amount of moisture away.Two pockets fully zippered with sturdily built zips to avoid falling off when You carry phone or wallet to your training session. The knee cap area has a relaxed pattern for ease of mobility and adjustable to suit your personal style or comfort. 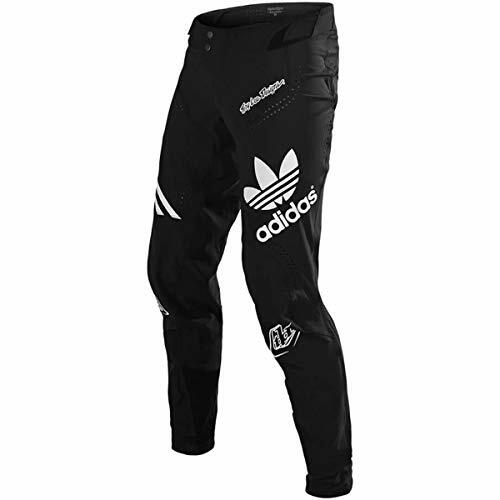 These pants have zippered ankles designed for putting over the boots and thus reduce the flap and loose fitting. long distance cyclists or avid hikers, the reflective logo assures safety in the dark. It's also an essential safety requirement for riders at night, early mornings or at dusk. These pants are not just intended for outdoor. 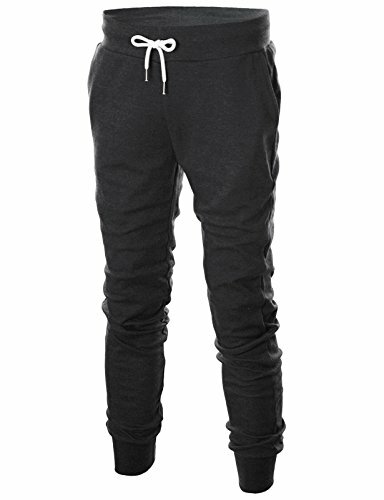 They can also be worn as comfy luxury pants inside the house during chilly or cold weather when you are not outside. 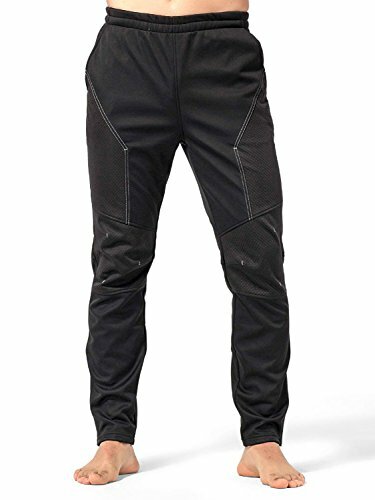 Double-layer synthetic material (75% polyester) in the front, which gives the pants a unique water repellent quality without being too clingy or tight. This offers the athlete more flexibility in mobility. Breathable material on the back, which is composed of 85% polyester 15% spandex. Engineered to offer the athlete extra comfort levels through exceptional padding and cushioning. The improved aeration is quintessential in preventing excessive sweating during rigorous training sessions. Thermo-lined fleece interior. Useful for prevention of loss of heat from the body, even under extreme wintry or snowy conditions. 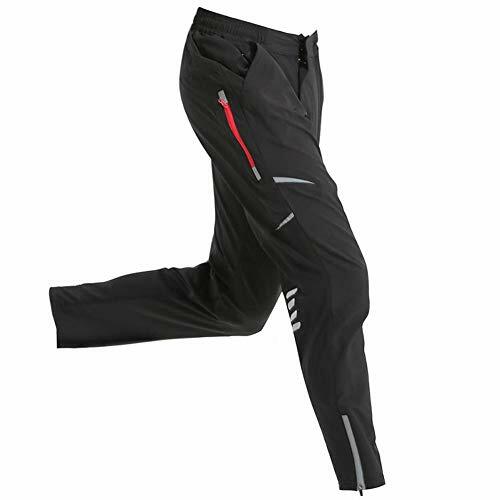 The thermal retention capabilities of these pants are also enhanced by the draping design in the knee area. Zippered pockets with sturdily built zips on each side coupled with easy to adjust leg openings. This gives the athletes the much-needed flexibility around the knee area. Made of fleece fabric, the design of this durable cycling wind pants fits body's curve with elasticity to reduce the wind resistance. You can use with cycling pants or shorts, also available for daily wear. 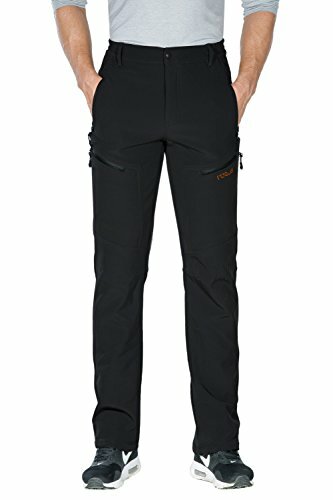 This pants is quick dry,lightweight,water resistant.It is comfortable for daily wear or outdoor wear.It is useful for hiking,climbing ,trekking,hunting,walking or other outdoor activity. Two velcro pockets on Back,two hand pockets,one zipper pockets and one velcro pockets on thighs. 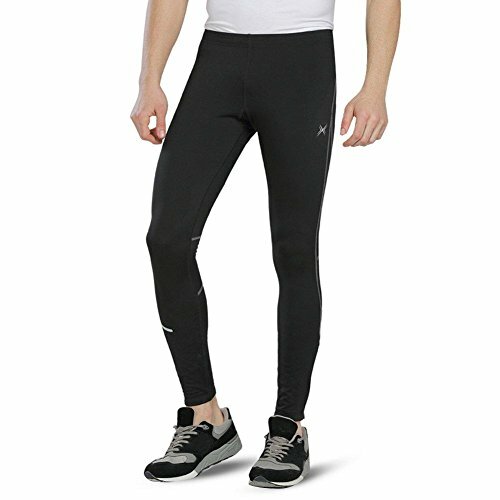 Designed with soft fleece and breathable fabric, Baleaf Men's Thermal Tights offers you long lasting warmth and comfort during your work-out on cold winter days. PROMOTION APPLIED- Add with Inbike Winter Men's Windproof Thermal Cycling Jacket together to your cart and insert the coupon code to save your money! Feature: DCA001, DCA015-Light weight and Thin fabric for Fresh activity / T Easy and soft / Drawstring closure / Drawstring with metal tips / Two hand pockets , DCA003, DCA017-Ribbed hems trim for jog/ Light weight and Thin fabric for Fresh activity / Easy and soft / Drawstring closure / Drawstring with metal tips / Sewed drawstring hole / Two hand pockets. Ohoo&GIVON brand was created by Ohoo&Company in Korea. Ohoo&Company is the sole authorized Seller of This brand products. Please make sure item Sold by Ohoo&Company before you buy. 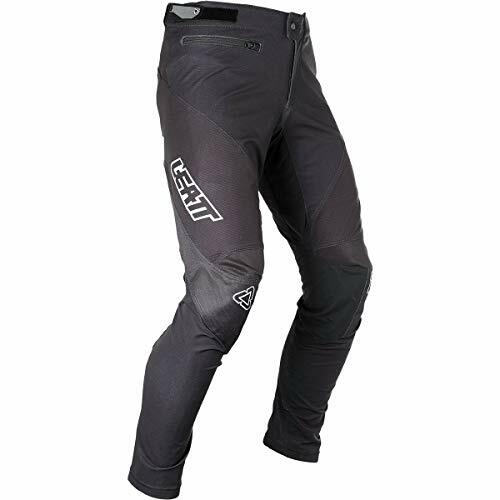 The front side is a bit short and longer backside design keeps your waist warm when you bending to ride and allows maximum freedom of movement for enhanced performance in a wide range of weather conditions. 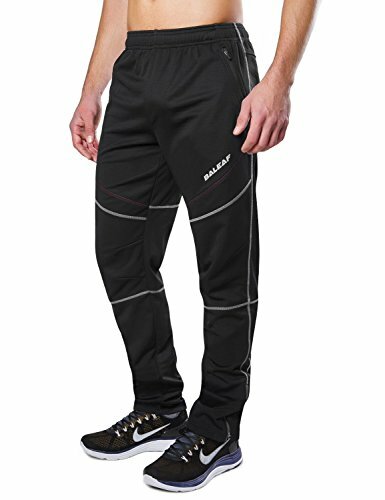 The versatility of pants allows you a variety of both outdoor and indoor use,incldes:cycling.walking, running, jogging, hiking, mountain climbing and any other outdoor fun. ERGONOMIC CONSTRUCTION & 3D Tailor:High technology stitching and special elastic fabric on the knees release the tension & pressure while cycling or having sports.Perfect for cycling,winter bike commute, running,walking or other outdoor sports. The Perfect Pants are going to become a cold weather favorite.These pants are water resistant. Featuring our partial adjustable waist and multi-functional pockets. Press the button to closure, featuring multi-function zipper pockets. Comfy and stretchy fleece fabric keep warm in the deep winter. Water-resistant and windproof are ideal for winter outdoor camping, climbing, hiking, skiing, cycling. Washing: Machine/Hand wash cold, No bleach. 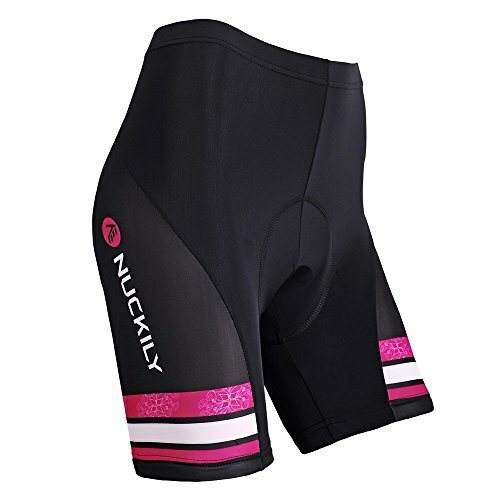 Nuckily is a technical sports apparel brand, founded in Guangdong, China (The World Manufacture Centre) in 2012. We are passionate about being outdoor and enjoying sport activities. Our cycling clothes collection is designed for all level riders from a novice to a professional. Company main goal is to provide a wide range of products to keep you outdoor, doing sport you love all the year round. At Nuckily, our in-house design and development team works with many global partners. We have an expert knowledge about different materials and manufacturing technology necessary for delivering the highest quality products. We strive to create stylish and durable apparel that allows its users to forget About outfit and focus fully on their sport. - NUCKILY outdoor sports products. Consider the double standard of price and quality! - NUCKILY products are suitable for spring, summer, autumn and winter. We set out to make the most technologically advanced race pants the industry has ever seen. Putting our elite athletes in the lab with Adidas and Troy Lee Design team, we set a high benchmark of technical parameters that we went above and beyond to create; the new ADIDAS ULTRA. The Leatt 4. 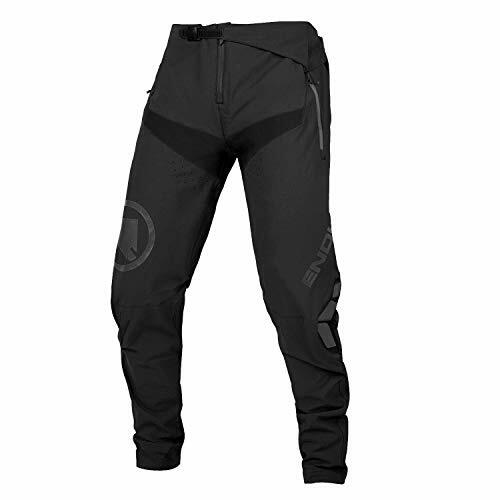 0 DBX Pants are designed for trail, downhill, and BMX riding, while maintaining the stretch and lightweight breathability necessary for those who want to earn their descents without the help of chairlifts or shuttles. Crafted from a four-way stretch material, these pants promotes agility when you're roosting around berms, launching off side-hits, and pushing yourself along the resort's A-Line, while the pre-curved knees prevent snagging when you're pedaling uphill to do it all again. They're finished with a water-repellent treatment, which is helpful for those located in wet climates or who ride tacky dirt after a light rain. The seat is reinforced with a 3-layer laminated material that combats the abrasive tendencies inherent to mountain biking, meaning this short won't blow-out prematurely from regular wear. Plus, the MoistureCool mesh lining ensures that cooling airflow continues to circulate all throughout the ride. For rough and rowdy days on the bike, make sure your kit starts with the durable, trail-friendly Endura MT500 Burner Pant II. 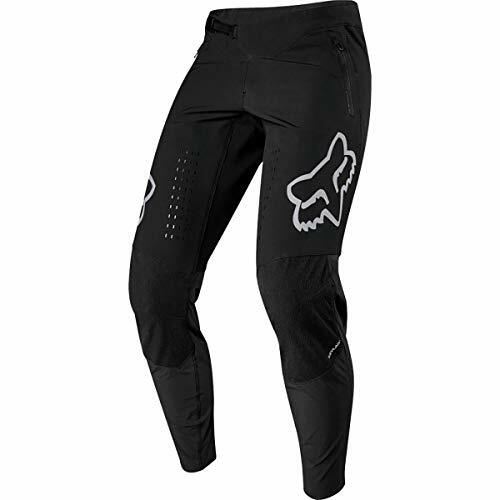 These mountain biking pants are crafted from a tough yet stretchy nylon to keep up with high-flying, white-knuckle days in the saddle, while the high-stretch crotch panels ensures your range of motion is unrestricted. Mesh panels on the back of the knees ensure that cooling airflow continues to circulate on warmer days, while the ratcheting waist adjuster secures the perfect fit every time you pull them on. Material: 100% Polyester, use breathable fabric, quick dry moisture-wicking and give you comfortable feeling when you exercise. 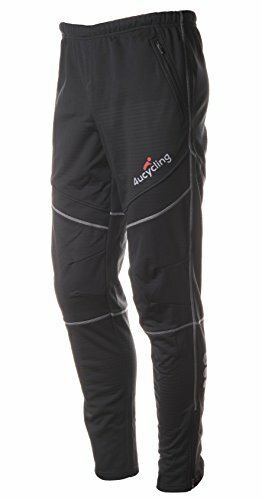 This cycling pants is compact and warm, windproof and waterproof. High elastic waistband for adjustable fit, side two zipper pockets to store your personal belongs, also the pants leg with zippers, its convinent for you to wear. Refelctive strips design, improves the visibility and enhance the safety of night sports. Occasions: suitable for professional cycling sports, walking, hiking, bikepacking trip, running, jogging and daily wear.